On Lyon Street, one of the victims of the nighttime tree butcher. Good question. The answer: Someone trying to demonstrate his profound stupidity and various other shortcomings. Someone whose existence suggests that evolution works backward too. We don’t know who it is. But City Manager Peter Troedsson told city council members in an email the Albany police were trying to obtain any video that might be available from businesses in the area. So there’s an outside chance the person responsble might be called to answer for the destruction. I counted 11 newly planted trees damaged along the left side of Lyon Street. Their slender trunks were snapped off about five or six feet up. 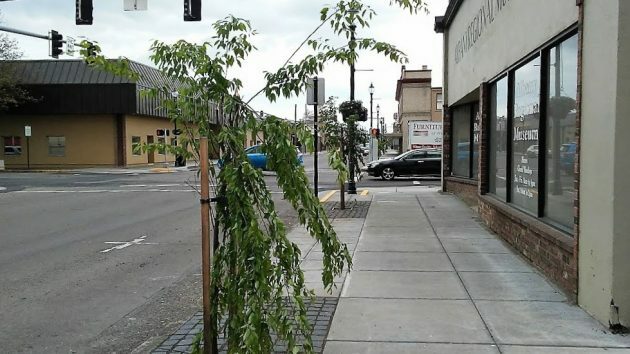 These pink cherries were among the more than 200 trees of various varieties planted as part of Albany’s downtown streetscape beautification program. The damage was done during the night from Saturday to Sunday. Rick Barnett of the Albany Parks Department, who serves as the city forester, said in an email there was other damage too, such as overturned planters on First Avenue. The parks crew plans to take out the damaged trees Tuesday or Wednesday. Barnett estimated that replacing them may cost up to $400 per tree as pavers in the tree wells will have to be removed and then reset. The best time for tree planting is past, though, so the replacement question is still unresolved. 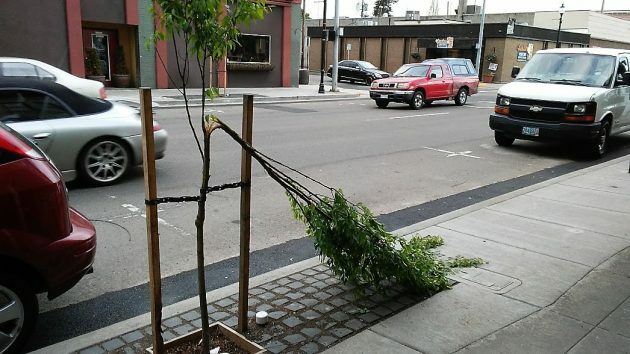 Another view of some of the broken young trees on Lyon Street Monday. I heard about this. It was through the drive thru at the bank. It was hard to hear. I caught the gist, though. Disgusting damage done! Your pictures now fill in the gaps HH. Comment made without reading your story first. I will right now. Despicable treatment of the trees, and flower pots that belonged to downtown businesses and individuals who live downtown! Anyone who cares about the health of the planet would not break off those trees. But, it could be a protest against all the taxpayer money spent downtown. We had perfectly good trees, that were taken out, which supposedly buckled the sidewalks. I did not see buckled sidewalks. The City, through CARA, spent 8.5 million of taxpayers’ money on beautification downtown — when we have many people who do not have enough to eat. Avid reader…don’t play the hunger card in this town. We have resources available for everyone in Albany. No one should be hungry here. As to the vandalism…..I have no words. Just disgust at the punks that did this. Avid…No one wants to hear political rhetoric right after they’ve been the victim of a crime. On a side note, flew into PDX yesterday. On approach, it’s usually one of the most beautiful views, especially when the sun is out. This time I noticed the pockets of encampment trash on the ground against the green Oregon backdrop…from 10,000 feet up, just heartbreaking. Ah yes, it makes perfect sense to protest the amount of taxpayer money the City spent, but forcing them to spend MORE taxpayer money to repair the damage. It is so sad that someone felt the need to be this destructive. I pray they were caught on camera at one of the businesses so they can be either put to work with the parks department to see how much work it takes to do that job or be made to make restitution. I too noticed this on Sunday. I was incensed that anyone would perform such a hack job on these beautiful trees. My suggestion is to research whatever events took place Saturday night that might have included a small group of malcontents or mischievous rowdies and then try to find out who attended the event(s) most likely to have attracted such lowlifes. It seems to me to be the sort of act one does in a small group of people all trying to impress each other with their “great feats of daring.” I hope they catch them. Vandalism deserves consequences. Why all the fuss? It’s just boys being boys. I can’t imagine anyone being in their right mind to do something so senseless like this! I hope whoever it is feels the weight of conviction on their hearts & comes forward to do the right thing. Either way here’s praying for the truth to be revealed! So very sad someone is so full of hate! I can’t imagine anyone being in their right mind to do something so senseless like this! I hope whoever it is feels the weight of conviction on their hearts & comes forward to do the right thing. Either way here’s praying for the truth to be revealed! Well it’s too early to tell who was behind this – or if it was planned or spontaneous. Given the time it was reported to have been done, it may just turn out to be one of those “things that seemed like a good idea at the time” (after a night to too much partying). Wasn’t there a Prom Saturday Night? If it were a planned thing – may turn out to be similar to what we learned about some of those wildfires (set by out of work fire-fighters). Will have to see if APD fails to solve the case but uses the damage to proffer more laws targeting “others”. It is interesting to read how many feel that these acts are “senseless” even as the city, the County, the State, the White House are all filled with senseless actions everyday and most of those go unreported and unconsidered. We have a President who prevaricates hourly. Yet no one seems particularly upset by his mendaciousness. When leaders prove themselves to be untrustworthy it seems logical that thugs, vandals and common criminals would take their cue from the Liar-In-Chief and bust-up the downtown greenery. This sounds suspiciously similar to some ridiculous thing our President would say. Have you two ever been seen at the same place/time? HH let my comment stand. I was saying the same thing, but with a bit of subtlety. No comment calling anything “nuts” has lately been disallowed.